Well, here we are starting off another year! I have lots of hope for a great year ahead and I'm going to make it a point to share more things in this space. 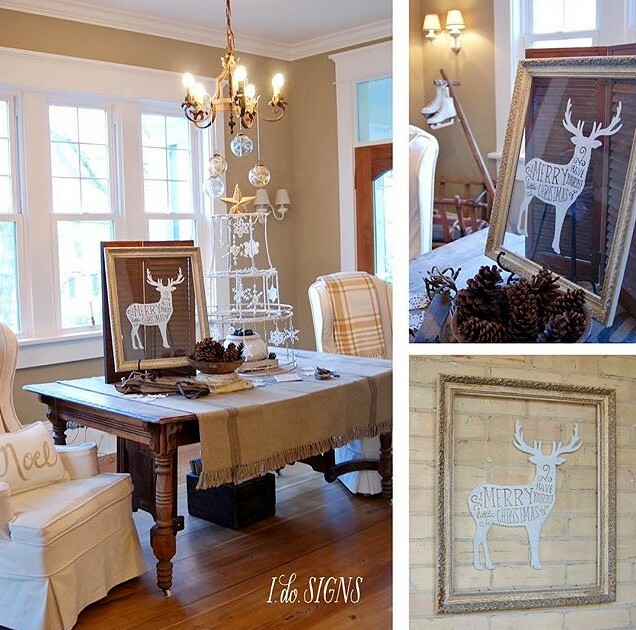 I have sewing projects planned and some home renovation projects that I'm dreaming of. I've been cleaning and organizing the house the past few weeks and I'm going to need to go through the sewing room soon! I've had these pictures taken since last year and I was hoping for a sunny day to take some brighter and warmer pictures but I don't think that's going to happen any time soon. We're into the cold, snowy days of winter but I wanted to share with you a few projects I've been working on. Over the past few months I've been rearranging and making my sewing area more useable. My husband built me this wonderful 4' x 7' cutting table! I'm so glad to move up off the floor to cut out cushion pieces. The top is a sheet of galvanized zinc and I'm hoping that over time it will get a nice patina on it. 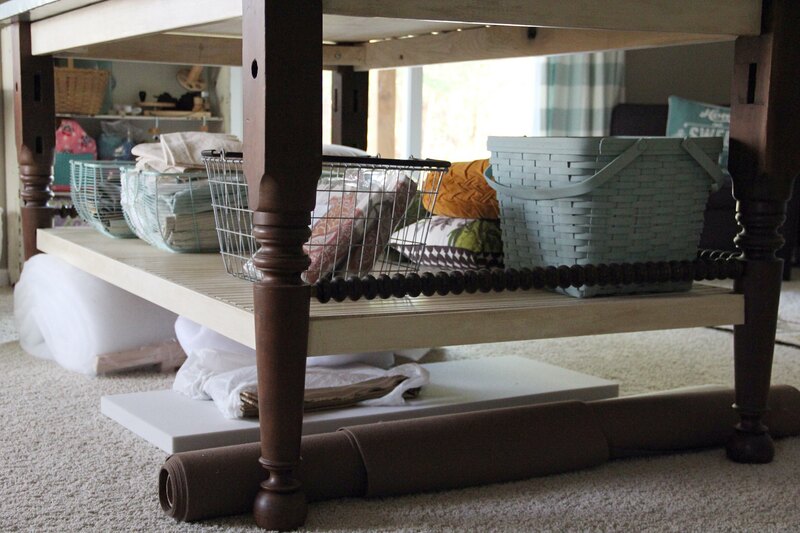 The legs of the table are from a vintage or antique rope bed. They are so pretty. 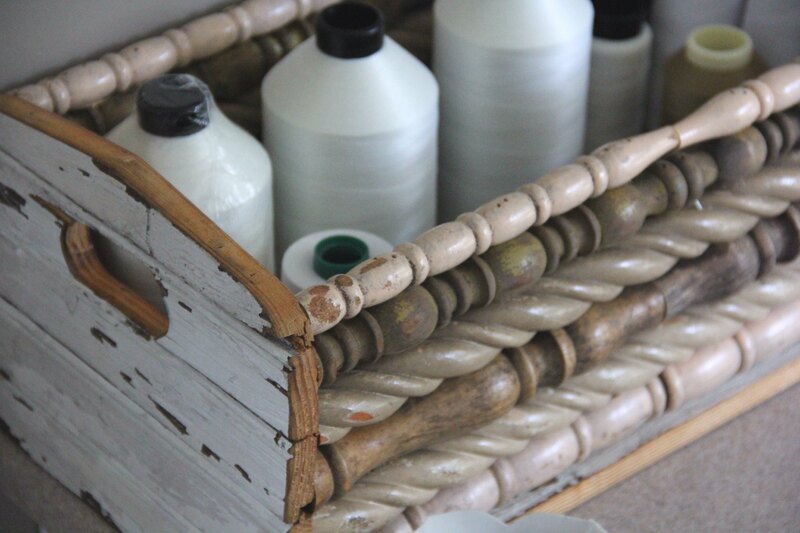 We turned them upside down and we used spindles from a jenny lind bed as a border that goes around three sides of the lower shelf. 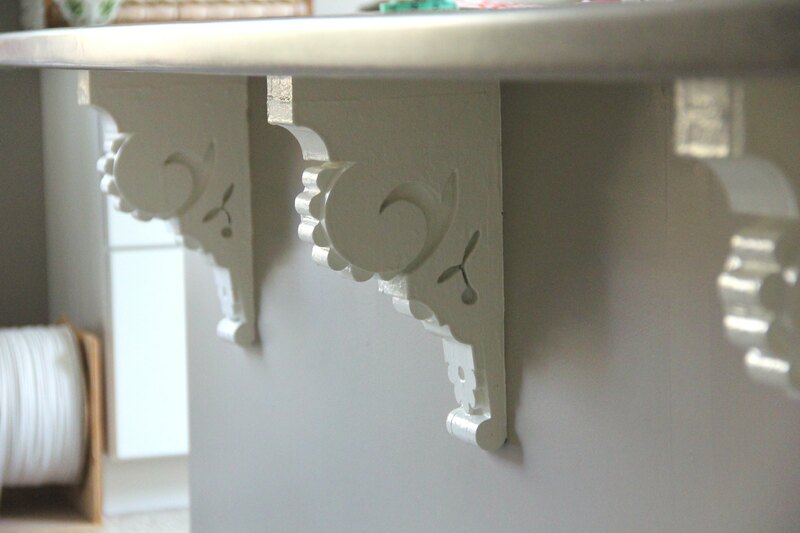 I thought that would be nice detail to add and that it would help hold things on the shelf. I found the rope bed pieces and spindles at Cherry Pickers in Shipshewana, IN. They have a wonderful shop and I know I'll have to stop there every time I pass through Shipshewana. 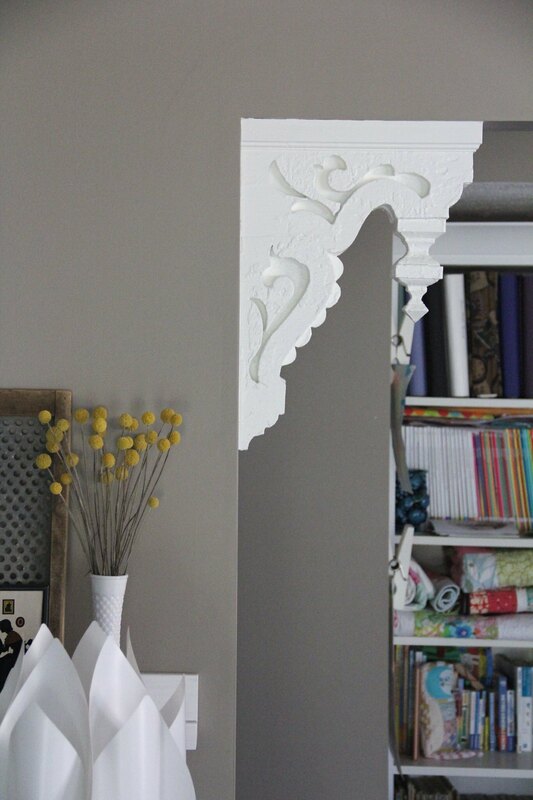 I added a few different salvaged architectural elements to the room such as the corbels shown above and the ones under the countertop (shown below). 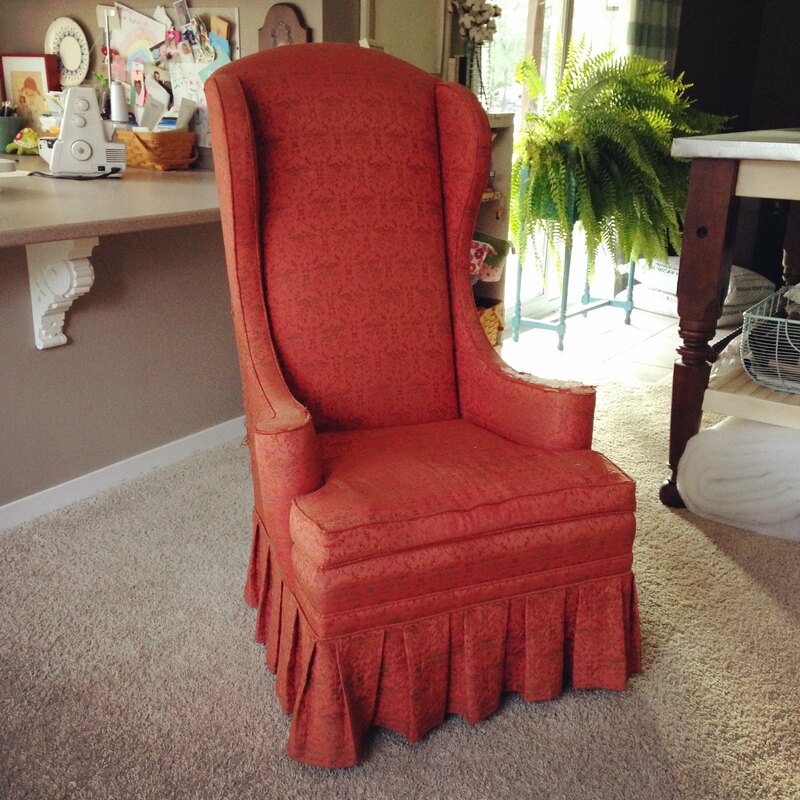 Before Christmas last year, I had the pleasure of making a pair of slipcovers for these unusual wing back chairs. These chairs were really tall and I think it's so fun to see the before and after pictures. They look completely different, don't they?! 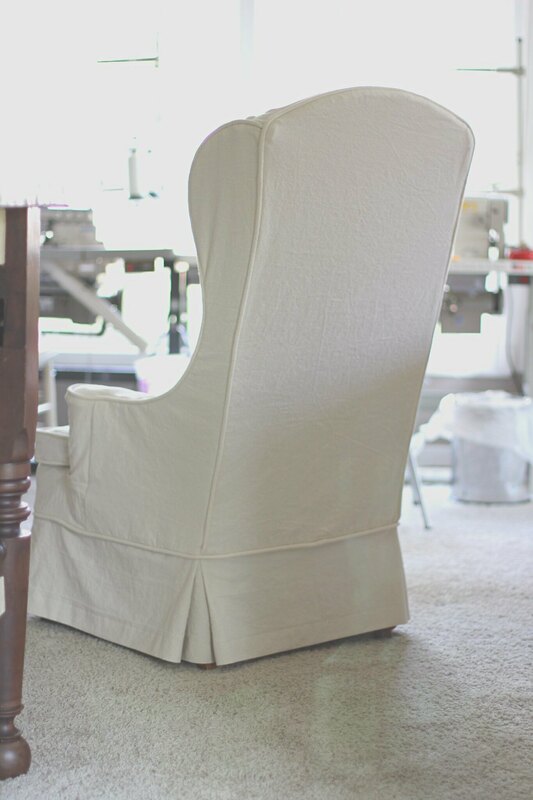 My client, Amber of i.do.signs brought these chairs to me and she wanted the covers made out of painters drop cloth fabric and chunky piping. It worked so well for these chairs. The slipcovers didn't need zippers in the back to get them on and off easily. So they look neat and tidy on the back. Amber shared this picture of the chairs on Instagram! 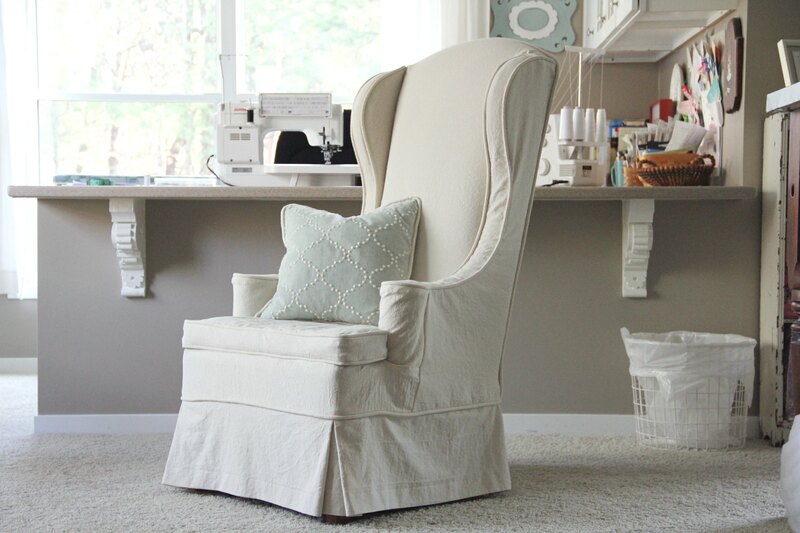 They look beautiful in her home and I know she will enjoy the versatility of having slipcovers for them when she wants to change up the look in her room. 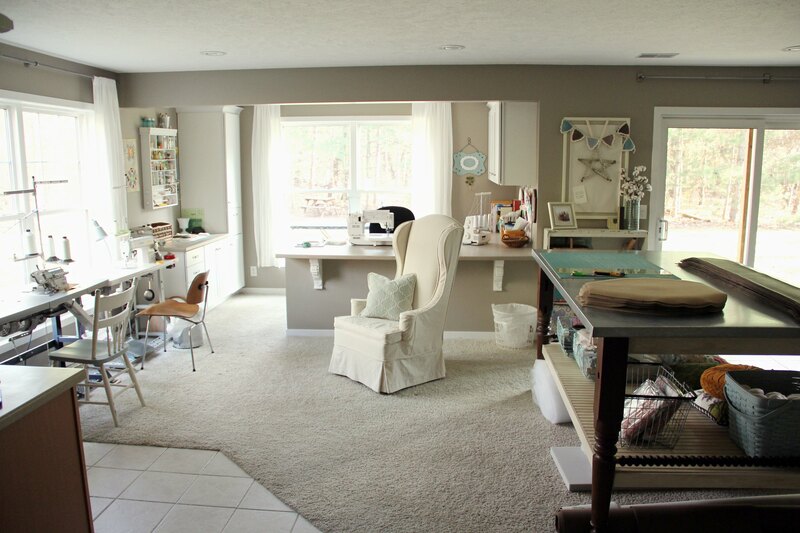 I love your sewing room! I wish I had more "natural" lighting in my sewing room! Mine is in the basement! 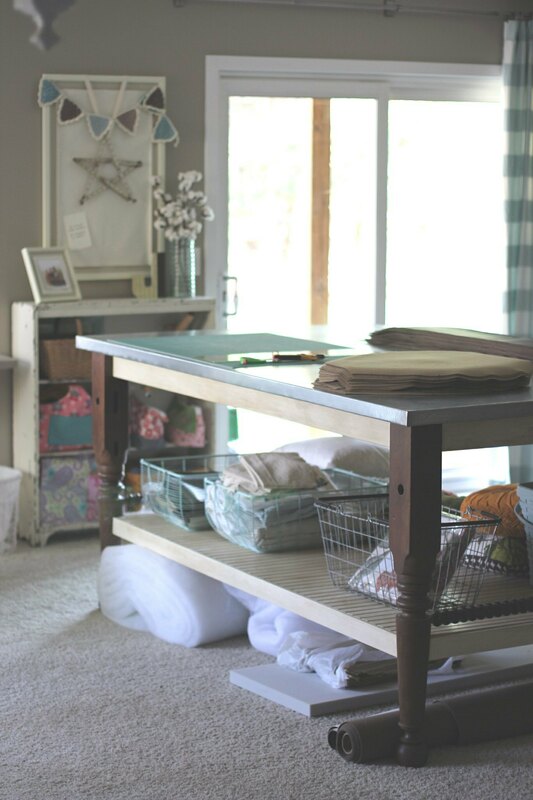 Your sewing room is fantastic. I wish I had your space. Mine is all tucked into a small bedroom and I'm trying to get as much space out of it as I can by having my husband build cabinets that will fit underneath my sewing table on the front and each side. Actually, I love that I don't have to walk or go very far for anything I need. But I do love the openness and brightness in your room. I bet it's lovely in the winter when the snow falls, in the spring when the flowers are blooming and all the other times of the year. It truly is a lovely room. Your room is beautiful! Can I ask what color is the paint on the walls? That's what I'm looking for for our living room. Your work space is amazing! 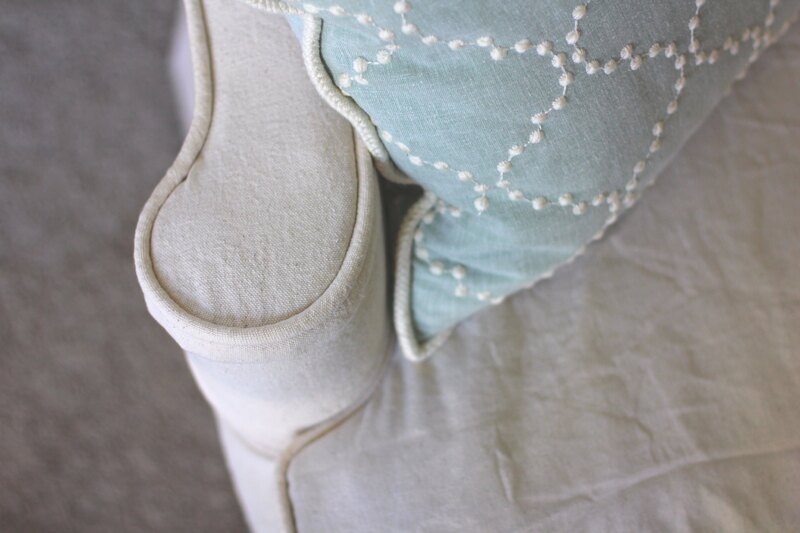 I love the little details that you have added... as with your upholstering... you are a master at details! An occasional chair is a beautiful piece of furniture that is an essential item in every house and one such chair in beautiful hand carving, hand polishing and quality upholstery certainly goes on to enhance the decor of a living space, especially a library or a guest room and also adds to the functionality aspect.